Andrew Pears was originally a barber from Cornwall. Moving to London, he opened a shop in Soho where he made powders and skin care creams. Pears would also would visit wealthy customers in their homes with new products. 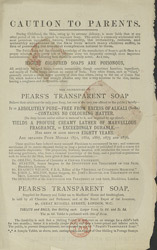 Through his interaction with customers, he realised that there was a demand for a gentler soap, particularly for shaving. Once launched, it became immediately popular, winning many awards at the Great Exhibition in 1851. Shortly afterwards, Pears opened new shops in Oxford Street and Bloomsbury in London. These shops made him and his brand a household name.